Wow. That’s pretty much all I have to say about these historical stock charts. There are a few times a year that you’ll see these big winners that gain hundreds and sometimes thousands of percent. For 2009, the upward trend began in March, but by April some stocks were really kicking into gear. Capturing a portion of each of these gainers would have greatly enhanced your year. But even if you didn’t, I would encourage you to review them. The charts are presented in a weekly chart format and gain figures from January 1 through December 31, 2009. I suggest you plug them into your daily chart program and measure them against your own stock trading strategy to determine if you missed anything that would have made you more successful in 2009. 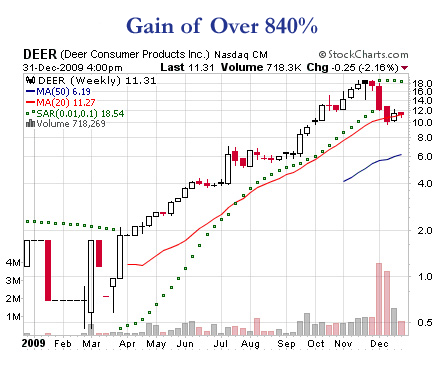 See what you notice about these stock market charts. Are there any general patterns you can pick up? Are there any candlestick patterns that show up? What was volume doing? 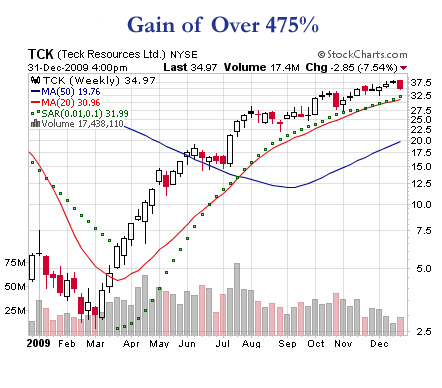 Whichever criteria you use for picking stocks, look at these big winners to see if your criteria would have found one or more of these gems during their big rise. Get your calculator out and imagine yourself having bought some of these winners in 2009. Or better yet, see if there’s anything else you can pick up to use in your stock trading strategies. 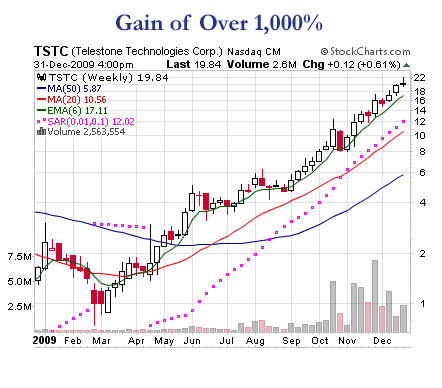 The Stock Chart Hall of Fame for 2010 is here with the best stock trading charts of 2010. Back from 2009 Chart Hall of Fame to Stock Market Charts. Look at a stock market history graph of the $INDU from 1900. 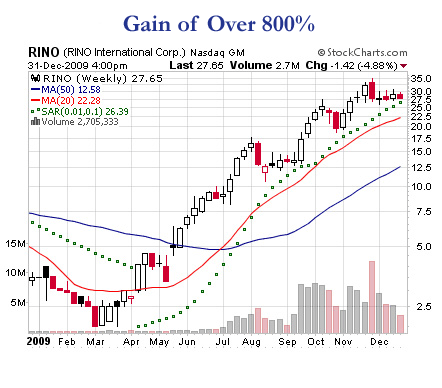 Back from 2009 historical stock charts to Learn Online Stock Trading.